RKD Films is your one-stop location for complete video or audio projects. We provide audio and video transfers, editing and duplication of your media onto DVD or we can convert your footage to be easily used and uploaded to the web. 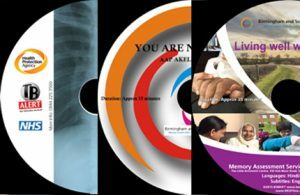 We can also create a customised DVD menu so you can accurately archive all your old memories with a unique designed DVD sleeve and face label. We can transfer and provide you with low cost DVD and CD duplications. Transfer your old memories from as little as ￡5.00 each. Customised DVD MENUS, DVD/CD sleeves and DVD/CD full face prints can be designed for you from as little as £5.00.